Greetings to you Dear Owner and Friend of Doberman, i want to tell you that you are a lucky person as you have chosen just this dog breed for yourself. You must have been in love with this dog if he lives at your home or is gonna enter your house as a part of your family. You are probably destined to investigate its brave and determined nature throughout many happy years of living together with this animal. They say, if you manage to correctly educate him, to find a way of dealing with it - you will get an invaluable canine companion very soon - dependable and alert guardian - though Doberman can be severe with enemies and abusers he is kind as a kid towards beloved owner. But it is a hard job to deserve love of this living being. It is desirable to make strenuous efforts to succeed in getting along with the pet. Actually not near each breed is honorable to be named after its creator. Freidrich Louis Doberman decided to give this dog his own name. He was a tax and rent collector. Specifity of his work and desire to get a very special dog having certain abilities were promotive of breeding short-woolled canines with smooth coat. Those dogs were intelligent and enduring. They also were willing to accompany their owners wherever they went. If necessary, the canines fought for interests of dearest owners. They say, that Doberman began intentionally working on the breed formation from 1860. As a breed Doberman Pinscher emerged in Germany. If you come across our online store for noble Dobermans while surfing the Internet - you are a fortunate soul! Be kindly advised that only here you will find the highest quality products at affordable price! Our qualified makers are also gifted persons - they create masterpieces! Explore wide variety of most distinguished canine goods - we have everything your need for your pooch! Each article is made to order from best materials. 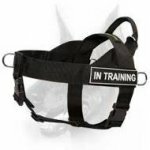 All our production meets the international requirements for canine gear. 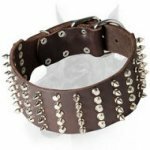 Among demandable products for your four-footed friend you will find leather or nylon leash, collar, harness, training equipment, bite sleeve, suit, toy. Whatever you like whatever imagine or dream of - our online catalogue with unseen choice of pet items will nicely surprise you! 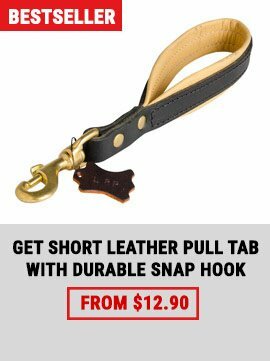 Extra strong dog leash capable of coping with Doberman power - this Versatile Leather Lead! 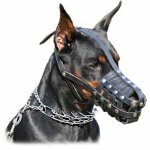 This manually built pet supply features special design: you may convert this gear in a choke collar or with its help to tether your Doberman to a post in order to visit nearest shop, for instance. Fully leathern leash combines best characteristics: durability, convenient usage, great performance, long life duration. This handmade facility is meant for dog training, management or walking. 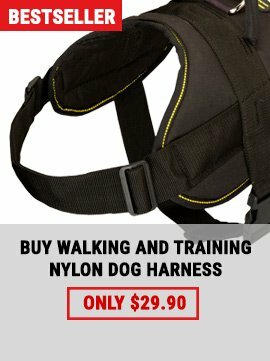 In case your hands get tired of leash tension - manipulate with the Rings' disposition - wrap the leash over your waist or across your shoulder and your hands are free! This hand-free equipment allows you to have better control of your pet! Such a leash is a dream of every Doberman handler. What about getting your pet easy controllable? 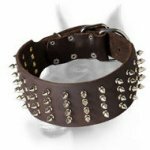 Nothing is easier than to handle him with superior Single dog collar can offer best features a reliable educative mean should have. 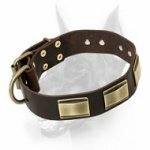 You will find Customized Leather Collar with Handle indispensable when instant control over your Doberman is needed. Due to built-in handle you will not need to leash your Doberman all the time - you can be short of time when it comes to attachment a leash to a collar of your pet. 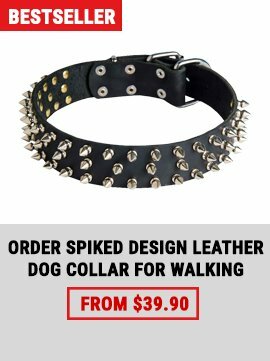 That is why our inventors want you to pay your precious attention to specially designed leather collar for fast management of even agile and powerful dog. All you need to do is to grab the handle right at the moment your pet is set about breaking away from you! 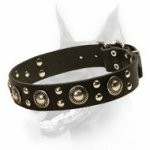 The collar will be your faithful assistant when you need to subdue your doggie. Use progressive training methods when dealing with Doberman but Perfect Canine Tool will not let you down.